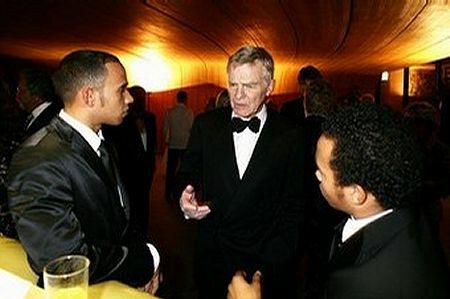 F1 drivers have been criticized in many quarters for their opposition to the FIA's increases in the Super Licence fee for both 2008 and 2009. They are paid millions, runs the argument, so it is hardly appropriate for them to squeal at having to fork out a greater fee for participation in the sport, especially at a time when other members of F1 teams are losing their jobs. Unhappy memories of the Great Baseball Strike in the States surface, together with the knowledge of what it did to the popularity of America's once pre-eminent sport. Max: "You'll get your trophy when I get my 270,000 euros." Yet these arguments are specious, depending as they do on envy of the admittedly-high salaries of the top drivers. The Super Licence is just like any other licence in that it indicates the competence of the holder to participate in the activity it covers and, as such, it should not be linked to earnings in any way. How would you feel, for instance, if the cost of your driving licence varied according to how much money you made in the previous year? As pointed out in Doctor Vee's excellent article on the subject, the real problem is the FIA's shortfall in its budget for the last couple of years. In attempting to solve its money worries by increasing the licence fee, the FIA is behaving exactly like the company that tries to economize by rationing stationery supplies to its employees; instead of tackling the problem at its source (usually too many freebie junkets for its executives), the organization looks for innocent but powerless areas to squeeze money from. It is the kind of entrepreneurial risk-taking that was a hallmark of Mr Dennis’s F1 career, a trait he is keen to highlight. "I am embracing this recession in a positive way," he says. "We are going to power through it." He repeats that phrase half-a-dozen times during the course of the interview. It may be that the drivers should contribute more to the finances of the governing body - indeed, they have offered to do so. But the licence fee is not the right place to attempt an increase in income beyond the rate of inflation. If it is appropriate that the drivers should contribute towards the cost of safety improvements that benefit them, then some form of "safety tax" could be introduced. The cost of a licence should be a flat rate for everyone, however. That, in essence, is what the drivers are saying. It is not an issue of greed similar to the strike by professional baseball players but an objection to the principle of funding shortfalls by the arbitrary increase of fees in unrelated areas. The drivers are right to protest and they deserve our support. It's wearying constantly complaining about the FIA and Mosely, can it really be that one dark soul can have such a baleful influence over the conduct of our sport? Well yes actually. Read anything he says or writes and his character comes through. Could the overspend on Fia's budget be due to the vendetta he is persuing against whoever "set him up" last year? It sounds like he has had investigators and lawyers scurrying about on his behalf for months so that he can make a case against somebody. His defence and this mucky grubbing about must cost a fortune, is it the FIA's? I agree that it becomes wearying to have to point out the failings of the Mosley/Ecclestone cartel that rules F1, Chrisess. The trouble is, not to do so is to let them get away with even more than they do already. There is no doubt that Mosley's campaign to remain in office despite the scandal of last year cost the FIA a lot of money - convening the meeting regarding his behaviour and getting all the delegates there wasted at least a million euros - money that could have been better spent elsewhere had he done the decent thing and resigned. Mmmm, looks like a simple competence tax - the more successful an F1 driver is, the more tax that driver pays. The reason is obvious, to finance the FIA perpetrators excesses, mistakes and personal greed. There’s really nothing new in this, corporations and governments world-wide practice the same system. Why can’t the FIA be similarly taxed to help cover these costs? For the same reason corporations and governments can’t - it’s a competence tax! I agree with your comments Clive. The odious Mosley knows that he has the drivers over a barrel; the teams and their sponsors will not allow them to strike, they have too much at stake. Added to which there is a queue about a mile long of competent drivers who would give their eye teeth to get into a Formula one car. The drivers can complain all they like but in the end Mosley will win, unfortunately. It's sad but it is just another example of the rather dubious, money grubbing way in which the sport is run. Max is starting to sound like the ex-bosses of HBOS and RBS. Looks like he knows his stuff, sounds like he knows his stuff, but in the end it all proves to be an act in an arena that required real action. Not to mention that he doesn't have a professional managerial qualification (just as the ex-bosses of HBOS and RBS didn't have a professional banking qualification between them). Let's see.... We've got to lower costs...so I'm going to raise costs. Pathetic bufoon! So, standardize driver's salaries but give them another title, another job and another salary as consultant. Alianora: Ah, but do you think we will ever hear a "sorry" from Max?